Nearly 50 million Americans suffer from chronic pain. As the population ages, that number is likely to increase. Many patients seek help not from pain specialists, but from primary care physicians or other healthcare professionals. At the same time, opioid abuse is at epidemic levels, leading regulators and law enforcement to place increased scrutiny on the prescribing of pain medications. Against this backdrop, it is critical that all prescribers have a solid foundation in the basics of chronic pain management. 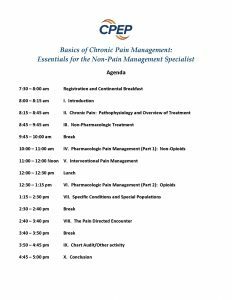 Basics of Chronic Pain Management is a one-day seminar that will help you treat this growing population of patients with safety and confidence. 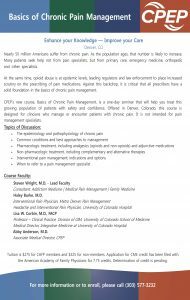 Offered in Denver, Colorado, this course is intended for those who are not pain management specialists. Like all of our courses, this program is designed to fulfill licensing board or credentialing requirements for remedial education, but is also appropriate for those who simply wish to improve their skills in this critical area. If you have already registered for the Prescribing Controlled Drugs course, you are eligible for a significant discount off the fee for Basics of Chronic Pain Management. Register now for both programs and save $300! Where and when is the course offered? 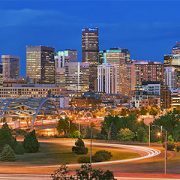 2019 dates are Saturday, July 13th and Saturday, October 12th in Denver, Colorado. How do I enroll in Basics of Chronic Pain Management? Enrolling in this course is easy. Please call 303-577-3232 and ask to speak with an Education Specialist. Who is eligible for Basics of Chronic Pain Management? This course is suitable for any healthcare professionals or trainees who treat chronic pain but are not pain management specialists. The cost for the course is $550. For those already registered for Prescribing Controlled Drugs, the cost is $350. After your initial registration, you will receive an e-mail confirmation of enrollment within 48 – 72 hours. This activity has been planned and implemented in accordance with the accreditation requirements and policies of the Accreditation Council for Continuing Medical Education (ACCME) through the joint providership of UCHealth Memorial Hospital and CPEP. UCHealth Memorial Hospital is accredited by the Colorado Medical Society to provide continuing medical education for physicians. UCHealth Memorial Hospital designates this live activity for a maximum of 8 AMA PRA Category 1 Credits ™. Physicians should claim only the credit commensurate with the extent of their participation in the activity.